PVMBG reported that seismicity at Awu fluctuated but declined during 1-30 October; the maximum number of shallow and deep volcanic earthquakes were eight and three, respectively, which were in the normal range. Solfatara plumes rose as high as 25 m above the vent. The Alert Level was lowered to 1 (on a scale of 1-4) on 31 October. Awu's eruption on 6 June 2004 and its elevated seismicity in early August 2004 was previously reported (BGVN 29:10). This report covers the last half of August 2004, which had not been reported on previously. Since the 6 June eruption, observation of the summit failed to reveal any significant changes (table 3). The hazard status of Awu during this August report remained at Level 2, having been elevated to 4 (the highest on a scale of 1 to 4) at the time of the 6 June eruption and then lowered on 14 June. Table 3. Seismicity at Awu during August 2004 as reported by DVGHM. Information Contacts: Dali Ahmad, Directorate of Volcanology and Geological Hazard Mitigation (DVGHM), Jalan Diponegoro 57, Bandung 40122, Indonesia (URL: http://www.vsi.esdm.go.id/). PVMBG reported that the number of earthquakes at Awu had risen significantly on 11 May and remained elevated through 14 May; a downward trend in seismicity became evident on 21 May. Earthquake hypocenters were located at depths between 1 and 2 km. The Alert Level was lowered to 2 (on a scale of 1-4) on 14 June; residents and tourists were advised to stay 4 km away from the crater. PVMBG reported that seismicity at Awu fluctuated during April and the first part of May. On 11 May the number of earthquakes rose significantly; the number of local tectonic and deep volcanic earthquakes was the highest recorded in the last year, and the number of shallow volcanic earthquakes was the second highest recorded (the highest number was recorded on 24 November 2015, prompting an increase in the Alert Level). Earthquake hypocenters were located at depths between 0.5 and 4 km. On 12 May the Alert Level was raised to 3 (on a scale of 1-4); residents and tourists were advised to stay 4 km away from the crater. PVMBG reported that on 24 November the number of shallow volcanic earthquakes at Awu increased significantly from a baseline maximum of 4 per day to 258 events; only seven events were recorded the next day. Seismicity continued to decline during 2-15 December. Fog prevented visual observations of the crater. The Alert Level remained at 2 (on a scale of 1-4); residents and tourists were advised to stay 3 km away from the crater. PVMBG reported that during 1-24 November the seismic network at Awu detected a significant increase in seismicity, especially in the number of shallow volcanic earthquakes (from a baseline maximum of 4 per day to 74 events on 24 November). The Alert Level was increased to 2 (on a scale of 1-4). Fog prevented visual observations. At 1715 on 16 May a pilot reported a low-level plume above Awu. No ash was seen in satellite imagery about one hour or eight hours later. During 15-16 June, there was no significant volcanic or seismic activity at Awu. "White smoke" rose about 50-100 m above the summit. Awu remained at Alert Level 3 (on a scale of 1-4). On 13 June, DVGHM reduced the Alert Level at Awu from 4 (the highest level) to 3 after volcanic activity decreased. On 9 June, two moderate explosions rose about 2 and 3 km above the volcano. Ash drifted SW and was deposited in the villages of Tabukan utara and part of Kendahe, and at the Taha airport. After an eruption on 10 June at 0529, volcanic activity dramatically decreased with only "white smoke" rising ~50 m. This low-level activity continued through at least 14 June and the Taha airport planned to reopen. According to a news report, most of the ~20,000 people who were evacuated from near the volcano around 8 June were permitted to return home. Only some villagers from the N slope of the volcano remained in shelters. According to news reports, Awu began erupting small ash plumes on 5 June. On 7 June, following a 48-hour-long period of increasing activity, authorities raised the Volcano Warning Level from Alert to Ready at 1040 and finally to Beware, the highest level of alert, at 1600. By 8 June, continuous small earthquakes were occurring and small eruptions produced gas-and-ash plumes and threw small ballistics up to 2 km above the summit. Up to 20,000 people have been evacuated from the area around the volcano. DVGHM reported a sudden increase in seismicity at Awu beginning on 16 May when 12 volcanic earthquakes were recorded. In addition, tremor was recorded during 1110-1540. Gas plumes rose ~75 m above the crater that were thicker than earlier in the month, but they did not change color or form clumps. On 18 May, six volcanic earthquakes were recorded and tremor continued. The same day DVGHM raised the Alert Level from 1 to 2. According to news reports, on 21 May hundreds of residents of the villages of Manente, Kolongan, Kendahe, and North Tabukan began to flee due to fears of an eruption. Seismicity increased at Awu on 15 November, but during 19-24 November decreased back to "normal levels." There were no surface changes around the volcano's summit. Awu remained at Alert Level 2 (on a scale of 1-4). VSI increased the Alert Level at Awu on 15 November following an increase in seismicity. Normally four earthquakes occur per day at the volcano, but 32 volcanic earthquakes were recorded on 15 November during 0000-0900. No surface changes were observed around the volcano's summit. The following information, from the Bulletin of Volcanic Eruptions for 1968, is for an unknown starting date in August, supposedly ending in September. The earthquakes may have been tectonic and related to the large Northern Celebes Earthquake on 10 August 1968. "Rumblings. Continuous quakes recorded, including 10 felt ones. Those quakes caused avalanches from the inner crater wall filling the lake. Besides, a landslide in the inner crater wall the size of a house blocked the path to the crater bottom." Information Contacts: Djajadi Hadikusumo, Geological Survey of Indonesia..
Information Contacts: Governor of North Sulawesi, Manado, Celebes, Indonesia. During 4 March fieldwork, a thin white vapor plume continued to emerge from the crater. The volume of the crater lake seemed unchanged from the previous month at about 600,000 m3, but its pH had dropped to 3, from 5 in February. Lake-water temperature ranged from 31 to 36°C. Solfataras N of the crater had temperatures of 78-101°C, while those S of the crater were at 55-100°C. Deep volcanic earthquakes occurred at a rate of ~1/week. Information Contacts: W. Modjo and W. Tjetjep, VSI. The crater lake was visited on 11 May, following a sudden drainage of ~80% of the lake (from ~3.5 x 106 m3 to 0.7 x 106 m3) on 1 February. Water temperature was 31.1°C and pH was 2-3, similar to 4 March values (17:02), cooler but more acid than the 36°C and pH 5 measured in February. Fumaroles along the inner N wall of the crater emitted steam that rose 25-40 m and had temperatures of 70-92°C. Active solfataras, with temperatures of 70.6-97.4°C, had left substantial sulfur along the S and E walls. In the SE section of the crater, a deep vent 20 m in diameter produced a thick 50-m-high steam cloud that smelled of sulfur and was accompanied by an audible boiling sound. The presence of lithic ejecta around the vent suggested that it had been formed by a phreatic explosion. Tectonic and volcanic A-type earthquakes were recorded at the volcano every month during January 1991-January 1992; volcanic A-type events ranged from 2 to 18/month. The Volcanological Survey of Indonesia (VSI) issued reports of activity at Awu during June-July 2000, November-December 2002, and more recently during January-early March 2003, all of which are summarized here. During June 2000, VSI reported an increase in seismicity, especially deep volcanic earthquakes (table 1). Satellite-relayed monitoring (by ARGOS) showed an increase in seismic energy beginning on 18 May 2000; deformation data showed inflation of ~800 µrad since 23 May. Table 1. Seismicity reported at Awu during 13 June 2000-2 March 2003. Courtesy VSI. During 14-16 October 2002, tremor was recorded and was followed by a felt tectonic earthquake with an amplitude of I-II MMI on 10 October. Soon after the tremor activity decreased, volcanic earthquakes began to be recorded (table 1). VSI reported a significant increase in seismicity during mid-November 2002; volcanic earthquakes that normally occurred less than five times per day occurred 81 times on 15 November. Activity decreased to normal levels by late 2002. Visual observations of the summit did not reveal significant changes. Volcanic earthquakes continued during January-early March 2003 (table 1). Awu remained at Alert Level 2 (on a scale of 1-4). A dome-extruding eruption occurred in the previouly lake-bearing summit crater of Mount (Gunung) Awu, a stratovolcano in Northern Indonesia off the N end of the island of Sulawesi (Celebes). Details of the eruption are still emerging, but an early dome had clearly extruded by 2 June 2004 (figure 1). Figure 1. A close up of Awu's new dome as it appeared amid loose tephra and through a steam-laden atmosphere on 2 June 2004, soon after emplacement began. Courtesy Penduduk. 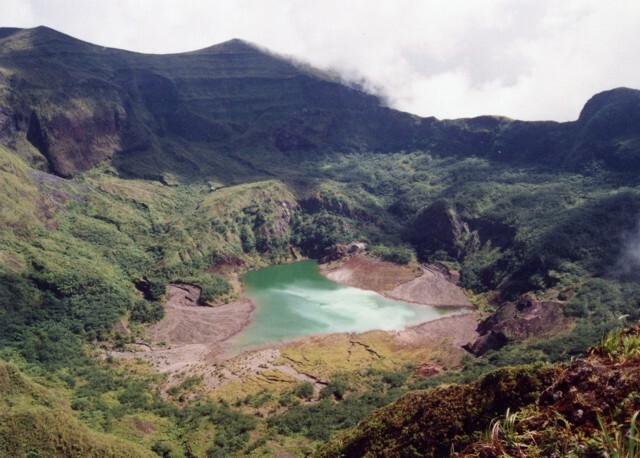 Prior to the eruption the crater contained a green lake. Before 1992, water volume was 35,000 x 103 m 3, but it decreased continuously, and in 2003, only 50 x 103 m 3 remained. Research carried out in 1993-1995 attributed the water loss to active faulting beneath the crater. Water inside the crater was of great concern because of its potential to produce lahars that could threaten settlements around Awu. Prior to the eruption, thick vegetation covered the crater's inner and outer rims. Awu's previous eruption took place 12 August 1966. It took 39 lives, injured more than 1,000, and forced ~11,000 evacuations. Signs of Awu threatening to erupt became clear mid-May 2004. They included a 15 May (felt, I MMI) tectonic earthquake, followed by two volcanic earthquakes. On 16 May, there were 12 volcanic earthquakes recorded, events interpeted as a signs of fluid moving up, and supported by the appearence of tremor with peak-to-peak amplitude of 8 mm. A gas plume rose 75 m above the crater's rim. On 17 May there were 4 volcanic earthquakes; peak-to-peak tremor amplitudes had dropped to 5 mm. This pattern continued through 18 May, with the number of volcanic earthquakes typically standing at ~6 and tremor amplitudes at 5 mm. The S minus P (S - P) times dropped from 2.0-1.75 sec to 0.5 sec, suggesting a shallower earthquake source, a possible indication of stress moving towards the surface. In addition to the above observations, VSI scientists regarded the shortest historical repose time at Awu volcano as 25 years, an interval that had passed since the last eruption, and this became an additional reason for raising the alert level on 18 May. Figure 1, a photo from the VSI website shows a close-up of a dome on 2 June 2004 with intense steam escaping, indicating that at least portions of a dome had emerged by that time. In figure 1, the dome and surrounding tephra predominanly appear as gray, darker-colored spines and angular blocks and fragments, but occasional clasts of large white fragments, presumably pumice, lie sprinkled across the surface. Seismicity increased on 4-5 June during 2330-0130 when more than 30 shallow volcanic (Type A) earthquakes occurred. In contrast, typical May seismicity only included one earthquake per day. On 5 June during 1000-1300, instruments recorded 85 earthquakes. On 6 June during 0200-0430, they recorded 50; and during 0900-1010, they recorded 2-3 earthquakes per minute. Tremor followed, with maximum peak-to-peak amplitude of 24 mm. The hazards status quickly increased to its highest level ('IV,' WITA). 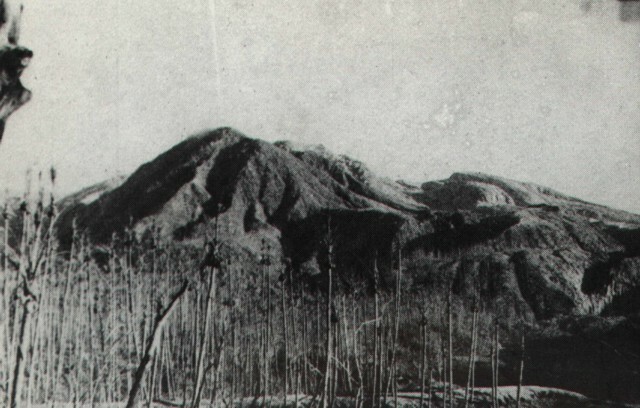 At 1230 on 6 June, explosion earthquakes of small size occurred, followed by a rain of thin ash, which fell to the N. Visible white ash reached 500-750 m above the summit. An explosion sent ash 1 km above the crater rim, and the ash fell around the summit. Tremor prevailed until 2000, with maximum amplitude of 5 mm. At this point, 20,000 residents had already been evacuated. Seismicity increased on 7 June; during the period 0000 to 0800 hours seismometers recorded 165 deep volcanic earthquakes, 18 shallow volcanic earthquakes, and continuous volcanic tremor-amplitude maxima exceeded 46 mm. At 1117 on 7 June, an eruption began at 1800 hours, with ash plumes rising 1 km above the summit. After the eruption on 7 June, seismic signals similar to tremor occured (at 1807), with continuous, peak-to-peak amplitudes of about 12-45 mm (maximum). During 7-8 June from 2000 to 0600, visual observers noted that 500- to 700-m-high ash clouds still hung over the summit. For the interval 0600-0600 8-9 June, VSI reported, "All day long there were many explosions." In additon, five major explosions were noted, at 1510, 1630, and 1730 on 8 June, and at 0606 and 0910 on 9 June. Presumably due to each of those larger outbursts, dark gray ash plumes rose up 1-2 km above the summit. Ash thickness at Tahuna was about 0.5-1.5 mm. Beginning on 8 June 2004 at 0800, Tahuna airport was closed. VSI noted that the ash rain could have reached Tabukan Utara and part of Kendahe, caused by the wind to the SW.
At 0529 on 10 June, Awu began a sustained eruption, described as the climax, lasting 34 minutes (figure 2). That event sent a column of gray to black ash to 3 km above the summit. The outburst was accompanied by low rumbling sounds and tephra. Figure 2. Ash plume at Mount Awu at 0529 on 10 June 2004. Courtesy of Wittiri, VSI, Directorate of Volcanology and Geological Hazard Mitigation. By 11 June, explosions and seismicity decreased drastically, with tremor amplitudes of only 2-3 mm. Until 13 June VSI recorded no deep volcanic earthquakes. At 0600 on 13 June authorities reduced the hazard status and some W- and ESE-flank residents returned home. Figure 3 documents fresh deposits, the presumably new dome, and denuded vegetation. Ash generally fell to the ESE. During the first eruption, ash fell on Tahuna city and its vicinity with a thickness of 0.5-1 mm. Surrounding villages received ash deposits as follows: Lenganeng, 2 mm; Naha, 2 mm; Bahang, 1.5 mm; Kalakuhe, 1.5 mm; and Mala, 1.5 mm. Figure 3. Recent tephra deposited below the Mount Awu lava dome, 12 June 2004. For scale, note the backpack-clad person standing on fresh tephra and amid stripped vegetation in the right-central foregound. Courtesy of A. Solihin, VSI, Directorate of Volcanology and Geological Hazard Mitigation (DVMBG). Inspection of the crater at an undisclosed time revealed a lava dome 300 x 250 m in plan view and 40 m in height. It is uncertain whether these values represent an early dome (figure 1) or larger, later dome (figure 3). On 14 June, observers saw a thin white plume rising 50-100 m above the crater. Beginning 17 June, the hazard status dropped to level II (Waspada). Following 18 June, seismicity declined, and instruments no longer recorded tremor. The latest Awu report, which discussed the interval 28 June-4 July, noted level II hazard status, plumes 50-200 m tall, and the observation of incandescent material, suggesting continued dome growth. UN Reports. According to an 8 June report from the UN Office for the Coordination of Humanitarian Affairs, the evacuation process triggered by Awu's eruption started on the evening of 6 June and continued through at least 8 June. The total number of people expected to be evacuated was ~27,000 (12,065 from Tahuna, 5,690 from Kendahe, and 9,248 from Tabukan Utara). As of 8 June, 17,326 people had been evacuated. These displaced people were accommodated in government buildings, schools, and houses of prayer. The Directorate of Vulcanology strongly advised the temporary halting of flights from Manado (at the N end of Sulawesi Island) to Sangihe Island. Information Contacts: Dali Ahmad, Volcanological Survey of Indonesia (VSI), Directorate of Volcanology and Geological Hazard Mitigation, Jalan Diponegoro 57, Bandung 40122, Indonesia (URL: http://www.vsi.esdm.go.id/); Office for the Coordination of Humanitarian Affairs (OCHA), United Nations, New York, NY 10017 USA. Awu extruded a new dome in its crater by 2 June 2004 (BGVN 29:05). Several photos received from the Directorate of Volcanology and Geological Hazard Mitigation (DVGHM) taken from the crater's upper S side illustrate the crater prior to and just after the 2004 dome emplacement (figures 4-6). Elevated seismicity continued into the week ending on 8 August 2004 (table 2). During 12-25 July, observers saw white thin-medium plumes gently rising to 50 m above the summit. A report covering 9-15 August, noted that the Awu observation post documented a weak plume 200 m tall. They also reported nine type-B earthquakes. A brief message from DVGHM on 7 December noted that Awu was then quiet. Figure 4. A N-looking photo of the Awu's crater taken in September 1995. Note the large ephemeral pond on the crater floor. Courtesy of DVGHM; photo by Kristianto. Figure 5. A N-looking photo from 25 May 2003 showing the active crater at Awu. Compared to the photo from 1995 (figure 7, above), the pond on the crater floor had shrunken. A photo from 8 December 2002 (not included in this report) showed that at that time the pond was largely gone. Courtesy of DVGHM; photo by Endi T. Bina. Figure 6. A N-looking photo of Awu's crater on 14 June 2004 showing the newly emplaced intra-crater dome and associated deposits. Disruption in the crater is also apparent, for example, the burial and heavy damage to vegetation . Thick steam made it difficult to see the distinctive rim on the crater's far side. Courtesy of DVGHM; photo by Agus Solihin. Table 2. Summary of volcanic type-A earthquakes and tectonic earthquakes at Awu during 22 June through 15 August 2004. Volcanic type-B volcanic earthquakes also occurred occasionally, perhaps once a week, except in the 9-15 August interval, when they occurred nine times. Data for several days and time intervals (eg., 6 and 11 July, and 26 July-1 August) was not available. Courtesy of DVGHM. Aviation reports. The Volcanic Ash Advisory Centre at Darwin, Australia, issued 15 reports (Volcanic Ash Advisories) regarding Awu during June 2004. These were the first and only Awu reports available in their archive of reports going back to 1998. The first message (on 8 June) was "Major eruption possible, but no eruption yet." Similar terminology accompanied Advisories until 12 June. The 9 June report noted "continuous small eruptions" and "four larger explosions in past two days." A plume also seen on satellite imagery was estimated by pilots to be at ~ 4.5-6 km. Later it became difficult to see the plume with satellite imagery. On 10 June two Advisories noted thin plumes directed NE extending ~ 37 km. The plumes were seen on imagery at 2325 and 0220 UTC (in aerospace shorthand, the imagery came from DVGHM, DMSP, GOES, and NOAA 17 satellites). The final Advisory, on 14 June, noted "Eruption details: Nil obs[erved] ash." That notice also commented that the alert status had dropped and no significant activity had been recorded, but a white plume rose ~ 100 m above the summit in the last 24 hours. Information Contacts: Dali Ahmad, Volcanological Survey of Indonesia (VSI), Directorate of Volcanology and Geological Hazard Mitigation, Jalan Diponegoro 57, Bandung 40122, Indonesia (URL: http://www.vsi.esdm.go.id/); Office for the Coordination of Humanitarian Affairs (OCHA), United Nations, New York, NY 10017, USA; Darwin Volcanic Ash Advisory Centre (VAAC), Bureau of Meteorology, Northern Territory Regional Office, PO Box 40050, Casuarina, NT 0811, Australia (URL: http://www.bom.gov.au/info/vaac/). The massive Gunung Awu stratovolcano occupies the northern end of Great Sangihe Island, the largest of the Sangihe arc. Deep valleys that form passageways for lahars dissect the flanks of the volcano, which was constructed within a 4.5-km-wide caldera. Powerful explosive eruptions in 1711, 1812, 1856, 1892, and 1966 produced devastating pyroclastic flows and lahars that caused more than 8000 cumulative fatalities. 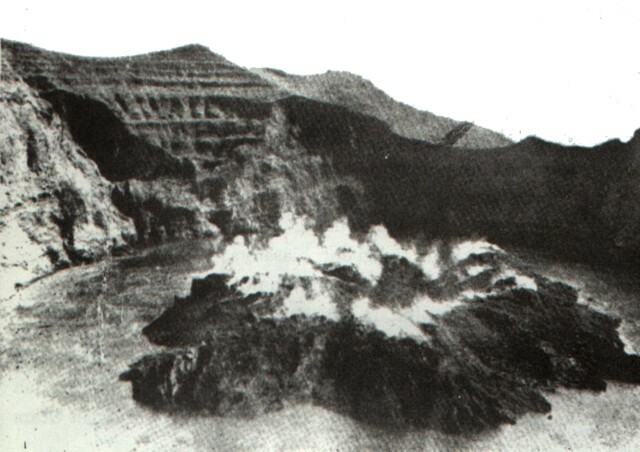 Awu contained a summit crater lake that was 1 km wide and 172 m deep in 1922, but was largely ejected during the 1966 eruption. Matahelumual J, 1985. G Awu. Bull Volc Surv Indonesia, 107: 1-51 (in Indonesian). Morrice M G, Jezek P A, Gill J B, Whitford D J, Monoarfa M, 1983. An introduction to the Sangihe arc: volcanism accompanying arc-arc collision in the Molucca Sea, Indonesia. J. Volcanol. Geotherm. Res., 19: 135-165. There is data available for 19 Holocene eruptive periods. There is no Deformation History data available for Awu. There is no Emissions History data available for Awu. A 1.5-km-wide, 400-m-deep crater at the summit of Gunung Awu volcano has produced many powerful eruptions since the end of the 17th century, many accompanied by pyroclastic flows and lahars that devastated areas around the volcano. Awu's crater contained a 170-m-deep crater lake in 1922, which was largely ejected during a major eruption in 1966, prior to this 1973 photo. Photo by K. Kusumadinata, 1973 (Volcanological Survey of Indonesia). Gunung Awu volcano, one of the deadliest in Indonesia, looms above the village of Bungalawang. Deep valleys that form passageways for lahars dissect the flanks of the 1320-m-high volcano, which was constructed within a 4.5-km-wide caldera. Powerful explosive eruptions in 1711, 1812, 1856, 1892, and 1966 produced devastating pyroclastic flows and lahars that caused more than 8000 fatalities. 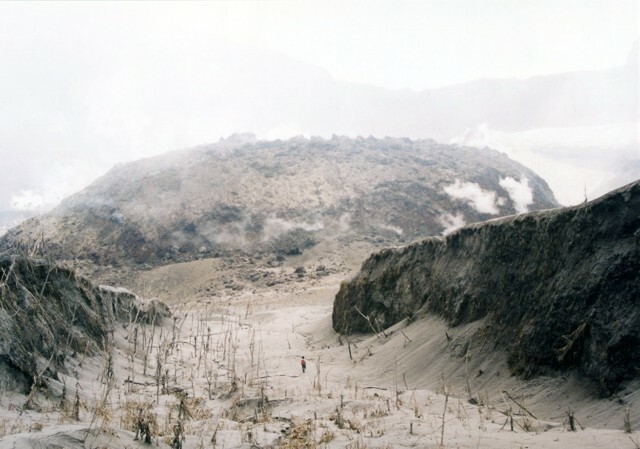 Photo by S. Dirasutisna, 1990 (Volcanological Survey of Indonesia). Massive Gunung Awu volcano is surrounded by the sea on three sides at the northern end of Great Sangihe Island. The flat-topped summit is truncated by a large crater that has been the source of some of Indonesia's deadliest eruptions. Deep valleys dissecting the volcano's flanks provide passageways for pyroclastic flows and lahars. Photo by J. Matahelumual, 1961 (Volcanological Survey of Indonesia). A lava dome erupted in 1931 that occupied the crater floor of Awu volcano is seen here prior to an eruption in 1966 that destroyed the dome. The dome first rose above the surface of the crater lake in April 1931, following the rise of the crater lake water level and temperature beginning in December 1930. The lava dome reached a height of 80 m by the end of the year. The explosive destruction of the lava dome during the 1966 eruption produced a rain of lithic fragments that injured more than 1000 people. Photo published in Kusumadinata, 1979 ("Data Dasar Gunungapi Indonesia"). This 1922 photo shows the roughly 825 x 1050 m wide, 150-m-deep crater lake of Awu volcano from the NW. On June 20, 1922 the previously clear crater lake water was covered with a layer of sulfur. A small gas eruption took place on July 23 and phreatic explosions continued during the following months. 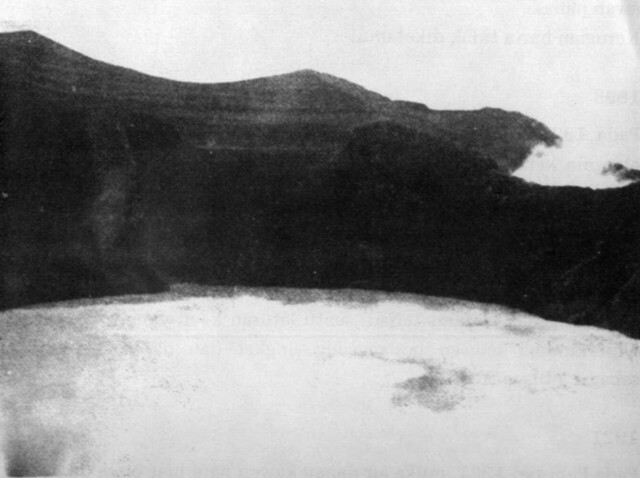 Lake bottom surveys by Stehn in 1922 indicated that a lava dome had formed beneath the surface of the crater lake. Dome growth was thought to have begun in 1921, when the lake level rose 3 m during a year of normal rainfall. 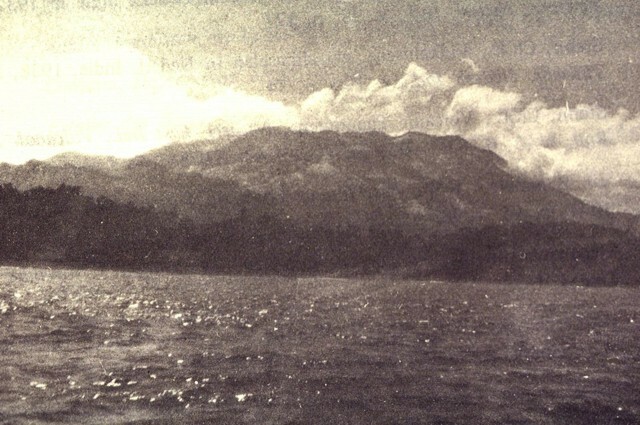 Photo courtesy of Volcanological Survey of Indonesia, 1922. Steam rises from a newly erupted lava dome emplaced in 1931 in the crater lake of Awu volcano. The crater lake water level and temperature rose beginning in December 1930, and continued into the next year, when rumblings, sulfur smell, and gas bubbles were observed. Dull explosions and an eruption cloud were noted at the beginning of March 1931. A lava plug appeared to be visible below the surface of the lake on April 7, breached the surface on April 18, and reached a height of 80 m by the end of the year. Photo courtesy of Volcanological Survey of Indonesia, 1931. 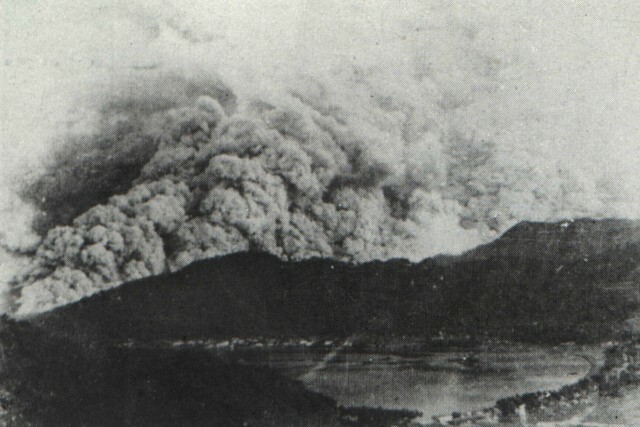 A pyroclastic flow in 1966 sweeps down the western flank of Awu volcano above the city and harbor of Tahuna. A major explosive eruption on August 12 ejected the lava dome and crater lake. Pyroclastic flows descended all sides of the volcano for an average distance of 5 km. There were 39 fatalities, and 1000 people were injured. Detonations were heard in the Philippine Strait. Following the paroxysmal eruption on the 12th, diminished explosive activity continued. The volcano was quiet in September, but three small eruptions occurred in October. Photo by J. Matahelumual, 1966 (Volcanological Survey of Indonesia). 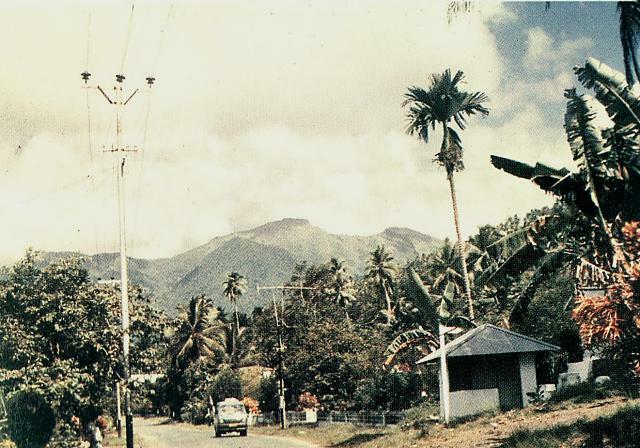 Coconut trees near Talawid village on the NW flank were decimated by ashfall during the August 12, 1966 paroxysmal eruption of Awu volcano. Nine villages were totally or partially destroyed, along with more than 3000 houses. The powerful eruption ejected the crater lake and completely destroyed a lava dome that had formed an island in the lake. Thirty-nine people were killed and more than 1000 injured, many from falling rock fragments originating from the destroyed lava dome. Photo courtesy of J. Matahelumual, 1966 (Volcanological Survey of Indonesia). 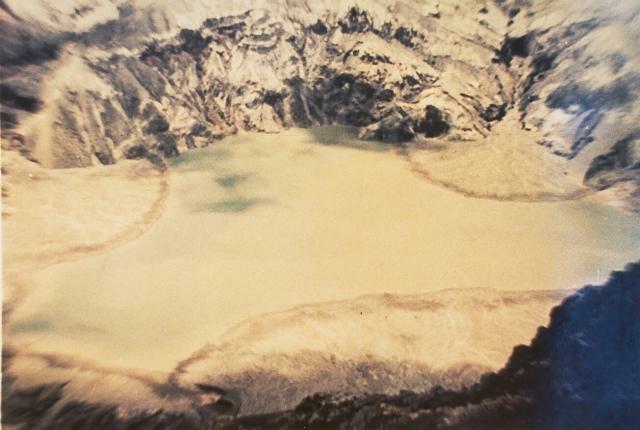 A shallow lake partially fills the summit crater of Awu volcano in this 1995 view. Gunung Awu volcano, one of the deadliest in Indonesia, is cut by deep valleys that form passageways for lahars dissect the flanks of the 1320-m-high volcano. Powerful explosive eruptions in 1711, 1812, 1856, 1892, and 1966 produced devastating pyroclastic flows and lahars that caused more than 8000 fatalities. Photo by Kristianto, 1995 (Centre of Volcanology & Geological Hazard Mitigation, Volcanological Survey of Indonesia). A newly formed, steaming lava dome occupies the summit crater of Awu volcano. Following increased seismicity, a small lava dome was noted on June 2, 2004. Explosive eruptions took place beginning on June 6, the largest of which, on June 10, produced an ash plume 3 km high. By June 14 the dome was 250 x 300 m wide and 40 m high. Incandescence was observed in late June to early July, and at the end of August (the last report) the dome was observed to have increased in size to the north, but had not increased in height. Photo by A. Solihin, 2004 (Centre of Volcanology & Geological Hazard Mitigation, Volcanological Survey of Indonesia). There are no samples for Awu in the Smithsonian's NMNH Department of Mineral Sciences Rock and Ore collection. IRIS seismic stations/networks Incorporated Research Institutions for Seismology (IRIS) Data Services map showing the location of seismic stations from all available networks (permanent or temporary) within a radius of 0.18° (about 20 km at mid-latitudes) from the given location of Awu. Users can customize a variety of filters and options in the left panel. Note that if there are no stations are known the map will default to show the entire world with a "No data matched request" error notice. Large Eruptions of Awu Information about large Quaternary eruptions (VEI >= 4) is cataloged in the Large Magnitude Explosive Volcanic Eruptions (LaMEVE) database of the Volcano Global Risk Identification and Analysis Project (VOGRIPA).